Having a bike with a cargo capacity of 100 litres, is a dangerous thing at time. So it was when I started thinking about fitting an airconditioner to my bakfiets for the hot Adelaide summer. 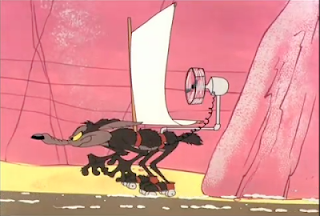 I am not the first person to contemplate strange contraptions on human powered vehicles. For example, someone made a fan-powered skate board. However, more famously the Wile E Coyote cartoons feature an almost endless stream of fascinating contraptions, including powering a set of roller skates using a fan and sail. Fortunately, I am not aiming for propulsion, just air movement for cooling. But hang on a moment, doesn't a moving bicycle generate enough air movement? Well, yes, except when you are riding slowly up a hill, in which case some air movement would be very welcome. This is especially true for a bakfiets which weighs 35KG empty, which makes for very slow hill climbs indeed. A bit of hard rubbish scrounging yielded a pre-loved pedestal fan. I attached this to a piece of plywood cut to the right shape so that it can fit in where the 2nd bench seat normally fits. A sealed-lead-acid battery and a small 240v inverter, and, presto, one airconditioned bicycle. Here it is after riding up to the University one morning. I have since put a full shield on the front. What is surprising is how well it works for something that is superficially absurd. The small battery can operate the fan for >30 minutes, and it generates a breeze which can be felt at ground speeds of up to 20km/hour, and does make one feel more comfortable while riding up hills when it would otherwise be still. It does also attract a lot of attention. 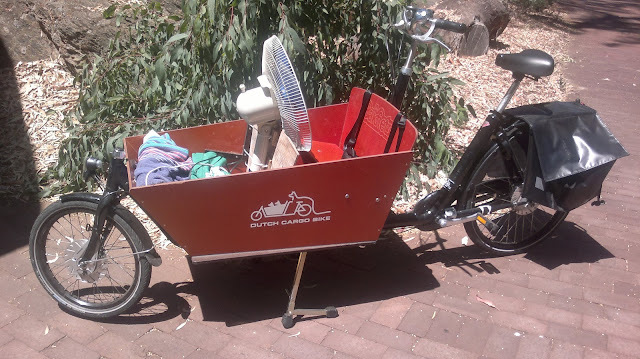 Of course to complete the look, I really should add some Wile E Coyote / ACME labelling on the fan and bakfiets. But the real next step will be to add evaporative cooling, which will hopefully make riding on the flat and uphill much more comfortable during these hot summer days. More on that in a future post.